I can’t help but feel somewhat sorry for the humble bean… Somehow beans have developed a reputation for being dull, bland and boring, and have almost become a symbol of the common perception of vegan food as being, well… dull, bland and boring. But not only is this not true about vegan food, it’s not even true about beans themselves. As with many other ingredients, it’s all about how you use them. Personally, I’m a huge fan of beans, both for their nutritional profile and also for the taste and texture benefits they bring to my cooking. But I don’t recommend eating beans alone or unseasoned, since I don’t think that’s the best way to enjoy them. According to some sources, beans were one of the first crops cultivated when humans began to develop agriculture, and their cultivation played a key role in the human evolution from a primitive existence toward a more stabilized one. It’s easy to see what an amazing development this must have been for early humans, since beans are not only a powerful source of nutrition, but they can be dried and stored for years. 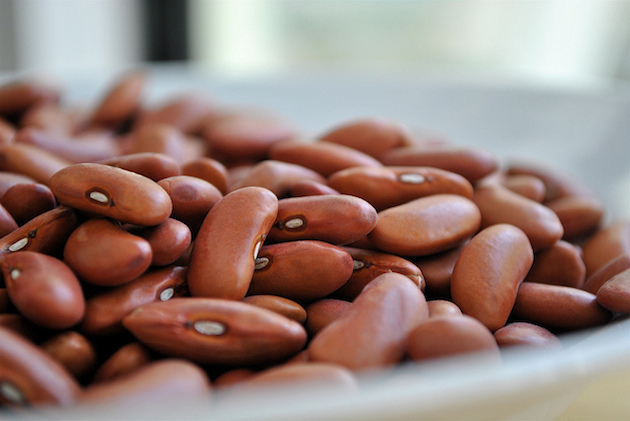 High in protein, fiber, B vitamins, phytochemicals and antioxidants, yet low in fat, sugar and of course cholesterol (which is only present in foods of animal origin), beans are simply one of the best foods available to us. On a non-busy day, I like to cook up a supply of beans that I can use later on in the week. Preparing things like beans ahead of time is a good way to minimize dinner preparation during the week when you have a busier schedule. If you have some pre-cooked beans in the refrigerator, it’s easy to just add them into a veggie sauté which can then become a substantial portion of your meal. When they’re mixed in with cooked veggies and well-seasoned, you’d almost never know you were eating beans. 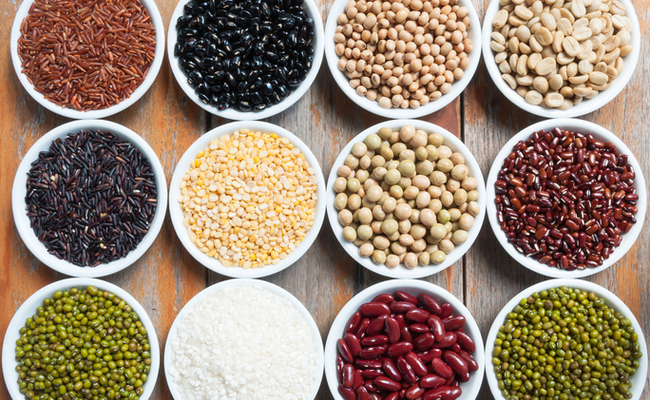 There are many different varieties of beans, so if you’re interested in taking advantage of their excellent nutritional benefits, I would suggest that you try a few different varieties to see which type appeals to you the most. Even if you think you’re ‘not a fan’, you may well be surprised by how much variation there is in the legume family. And if you’re willing to be a bit adventurous, you might even want to try some heirloom varieties. To cook beans easily and in less time, use a pressure-cooker. Check out this link for more information about this method. Most dry beans need soaking overnight before cooking. Soak in 4-5 cups of water to 1 cup of beans. Rinse with fresh water before cooking. 1 cup dry beans yields approximately 2 1/2 cups cooked beans. To cook: Bring water to a boil. Add beans, then simmer for specified cooking time. 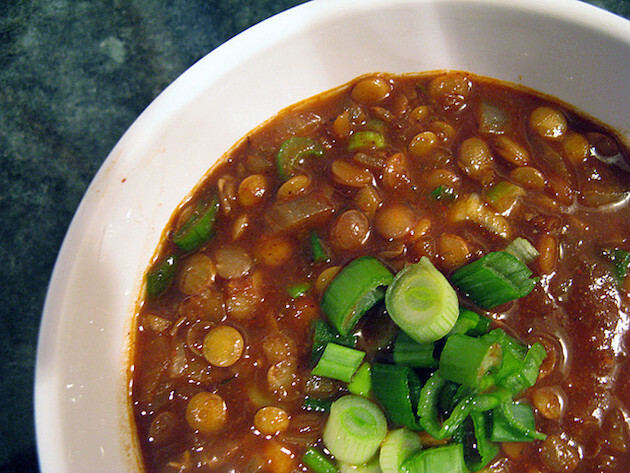 1 cup dry lentils to 3 cups water. No pre-soaking necessary. Cooking time: 30 minutes. Red lentils require less cooking time. 1 cup dry beans to 4 cups water. Soaked overnight, cooking time is 2-3 hours. Soaked overnight, cooking time is 3 hours. Soaked, cooking time is 60-90 minutes. 1 cup dry beans to 3 cups water. Soaked, cooking time is 90 minutes. Soaked, cooking time is 2-2 1/2 hours. Unsoaked, cooking time is 90-120 minutes. Soaked, cooking time is 60 minutes. Soaked, cooking time is 60+ minutes. Unsoaked, cooking time is 90 minutes. No soaking required. Cooking time is 90 minutes. No soaking required. Cooking time is 45-75 minutes. Soaked for one hour, cooking time is 1 hour. Unsoaked, cooking time is 90-120 minutes. Here are a couple of recipes that use my favorite variety: the gorgeous little black bean. Maybe it’s because my father used to make a great black bean sauce when I was younger (I can still just about taste it now), but whatever the reason, I’m a big fan of black beans. Here are some ideas to get you acquainted with them. 1. In a small bowl, whisk together dressing ingredients. 3. In large bowl, toss beans, watercress, peppers and corn with 1/4 cup of dressing. 4. Arrange greens on four serving plates. Top each with bean mixture and drizzle with remaining dressing. Sprinkle with scallions. 1. Place beans, bell pepper, onion and cilantro in a salad bowl. 2. Stir together cumin powder, vinegar and oil in a cup. Pour over bean mixture and gently stir, coating evenly. Season with salt and pepper, to taste. •Variation ~ In a food processor, using the “S” shaped blade, place all above ingredients along with three chopped garlic cloves and one tablespoon lime juice. Process until creamy to make a dip. Chill before serving. 1. Rinse soaked beans, then cook for one hour before beginning chili preparation. Drain beans and set aside one cup of liquid. 2. In a separate pot, sauté garlic, onion and pepper. When cooked, add tomato paste, tomato sauce and all other ingredients except tempeh/seitan, beans and bean stock. Continue simmering. 3. Add tempeh/seitan to the chili pot. Stir frequently. When beans are cooked thoroughly, add them to the pot with one cup of the bean stock. Simmer for another half an hour. 4. Serve in taco shells, over rice or with corn bread. 1. In a large bowl, combine all ingredients, except leaves and avocados. Set aside to marinate for two hours at room temperature. 2. Place 1/4 cup of bean salsa into each leaf using a slotted spoon. 3. Garnish with avocado and serve. •Variation ~ Toss Bean Salsa with hot or cold pasta. Lastly, a couple of easy recipes that you can whip up in the food processor. 1. Combine beans, water/stock, oil, nutritional yeast, garlic, and spices in the food processor. Process until creamy-smooth, adding more liquid to reach desired consistency. 2. Transfer to a bowl. Top with parsley and scallions. Serve at room temperature. In a food processor, using the “S” shaped blade, blend all ingredients. Chill.